Okay, admit it. If you’re a photographer, you came to this page first didn’t you? Thought so. Many years ago, for my day job as an automobile engineer and forensic photographer, I bought my first film SLR kit: a manual focus Minolta X700 with a couple off-brand lenses. After a couple years, I graduated to a Nikon F4 with a couple better quality third party lenses, and a passable tripod. When the Nikon F5 came out, I traded in my trusty F4, and upgraded not only my camera, but bought all Nikon lenses as well. I also got my first Gitzo tripod. That’s when I started taking photography more seriously. Initially, I resisted the digital revolution, consoling myself that I was practicing “real” photography instead. Even though I bought (and secretly loved) a 3.2 MP Nikon Coolpix 990 in 2000, I steadfastly held out from buying a DSLR until acquiring a Nikon D1x in late Summer 2001. I promptly sold all vestiges of my film equipment, including my film point-and-shoot cameras. I’ve never looked back. I’ve progressed through the Nikon pro-level DSLR cameras (D1x, D2x, D3, D3x, D3s, D800E, D810), and now use a couple Nikon D850’s. Each camera has been fitted with its own Really Right Stuff custom L-plate. For both my engineering work and my nature, landscape, and travel work, I now primarily shoot with ZEISS manual focus prime lenses. It took less time than I expected to get comfortable again with both manual focus (it’s truly precise and delightful with the ZEISS lenses) and primes instead of zooms. My ZEISS (ZF.2 Nikon mount) collection now includes: 15 mm f/2.8 Milvus, 18 mm f/2.8 Milvus, 21 mm f/2.8 Milvus, 25 mm f/1.4 Milvus (one of my second favorites), 25 mm f/2 Distagon T*, 35 mm f/1.4 Milvus, 35 mm f/2 Milvus, 50 mm f/2M Milvus macro, 55 mm f/1.4 Otus Distagon T*, 85 mm f/1.4 Otus Apo Planar T* (my favorite), 100 mm f/2M Milvus macro, and 135 mm f/2 Milvus (my other second favorite). There really is something to the famous “ZEISS” look! Color rendition and micro contrast on all ZEISS lenses are consistent and astounding. My Nikon lenses include the latest 24-70 mm f/2.8, 70-200 mm f/2.8, and 80-400 mm, along with the venerable 300 mm f/2.8 VRII. They’re wonderful lenses, too. Although rarely used, I have Sigma 8 mm and Nikon 16 mm fisheye lenses. Like most landscape and nature photographers, I must confess to both tripod and camera bag fetishes. But fortunately, I’ve mastered the fine art of justifying all of them. My Really Right Stuff (RRS) carbon fiber tripod collection now includes (from heaviest to lightest): TVC-45, TVC-44, TVC-34L, TVC-24L, TFC-14, and TVC-32G ground tripod. Oh, and there’s also the MC-34 carbon fiber monopod. Finally, there are the two small aluminum tripods: TP-243 ground level and TFA-01 Ultra Pocket ‘Pod. I also keep a purple meFoto tripod in both trucks so I’m never without a tripod. They’re surprisingly stable, and have decent ball heads with Arca-Swiss style quick release bases. Years ago, I switched to Think Tank roller bags, backpacks, and belt systems. They are almost indestructible, and are perfectly suited to heavy professional use. I rarely use backpacks anymore, but use different rollers to transport gear, and the belt system with various pouches in the field. My most-used roller was my old Think Tank Airport Security V2.0. I finally upgraded to a Security V3.0–almost a year after I bought it–which has an improved carrying system for a laptop computer and a tablet. It’s perfect for transporting all your gear when flying or driving. I use other Think Tank rolling bags when smaller bags are needed, including the Airport International V3.0, the great 4-wheeled Airport Roller Derby, and the Airport Advantage. 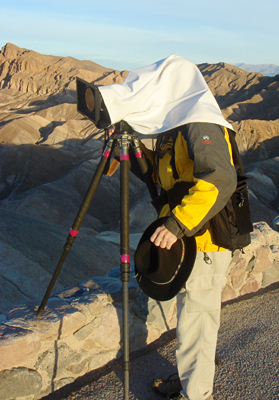 For landscape photography, my essential field gear includes: RRS TVC-45 or TVC-44 tripods (really tall and really stable) with LensCoat LegCoat covers; Arca-Swiss C1 Cube geared head (a treasure); a bunch of Nikon MC-20 cable releases; Tom Vadnais Photography weather-proof focusing cloth (now available from me—just e-mail); Lee filter holders with standard and wide angle hoods; and either ZEISS or Heliopan High Transmission (1-stop light loss) circular polarizers. If needed, I will also carry a selection of Formatt Hitech 95mm Firecrest Ultra ND filters; a Singh-Ray Vari-ND filter; or several Lee neutral density filters, including the Lee Big Stopper. I still have, but very rarely use, several Singh-Ray graduated ND filters. If I know I’m going to do any panning or subject tracking, I substitute the versatile Arca-Swiss d4 geared head for my Cube. A number of my friends have now purchased d4 geared heads, and love them, too. If my first geared head wasn’t the Cube, I would be perfectly happy with the d4. My ever-present crushable black felt fedora is not only incredibly fashionable, but serves double-duty as an extended lens shade. While traveling, all photo gear (except the tripod and fedora) is carried in a Think Tank Airport Security v3.0 rolling bag. When I get to my shooting location, I transfer what I am going to use in the field into a Think Tank belt system comprising a Steroid Speed Belt with a Pixel Racing Harness and a variable collection of Skin and Modular pouches, depending on the lenses and equipment I think I’ll need. Once you get used to carrying and working out of a belt system, you can’t go back to a backpack. It is fast, comfortable, carries easily, and never has to be set down. There are two downsides to using a belt system. For one, don’t try walking into an airport or a government building wearing a loaded belt system! You can imagine why. Also, you’ll likely never win a fashion award while wearing a belt system. But since you’re on the other side of the lens, who cares? Besides, you can always hide under your focusing cloth, if it really bothers you! So if you don’t wear it through airport security, and don’t attempt to enter a fashion show while wearing it, you’ll love working out of it. I couldn’t work without one now. The key to gear is, of course, to find the tools that help you to capture the image you envision. Extraneous useless trinkets, cantankerous tools, and poor quality equipment will only cause frustration, and will prevent you from concentrating on making the image. Buy the best, and you only cry once really applies to all photo gear. Even more importantly, make sure you’ll want and use any piece of photo kit that you carry into the field. If it doesn’t solve a specific problem, why are you carrying it? Why do you even own it? Pare down and eliminate the photo gear clutter. Then really learn to use the gear you have. You should be able to use it all without thinking about it. Now you can concentrate on making photos, not fussing with gear. Thanks for the hat info. Do you mentor photographers or provide one on one instruction? If so please provide some information on how you work and your pricing. Good talk last night at the RPS meeting. Where do you get the cards you showed for determining if it’s worth setting up your tripod. I can not find one and what is the correct name for it if card is not? http://dvattika.com/category/store/products/ This one is a bit expensive since it ships from Scotland. I handmade one to about the same dimensions as the one above with the goal that it would fit into my shirt pocket. I will give it a try and see if it helps. My wife is an oil and watercolor painter. She tells me that viewfinder cards are also used by painters to search for outdoor compositions before the before setting up to paint. Her viewfinder card is larger than my pocket-sized card. I use(d) the x700 and the F4 too.